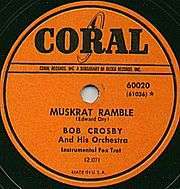 Coral Records was a subsidiary of Decca Records formed in 1949. It recorded pop artists the McGuire Sisters and Teresa Brewer, in addition to Buddy Holly. Jazz and swing music was issued on Coral in the 1940s. After Bob Thiele became the head of the label in 1954, it produced pop and rock musicians such as Buddy Holly, Jackie Wilson, Lawrence Welk, and Steve Lawrence and Eydie Gormé. He also produced hit songs by his wife, Teresa Brewer. In the 1950s, the label recorded Debby Reynolds's hit song "Tammy". In 1954 Coral became known as Vogue Coral in the UK. Coral stopped issuing new material in 1971. In 1973, MCA amalgamated Decca, Kapp Records and Uni Records under the single MCA Records banner, and Coral was repositioned as a mid-line and budget album reissue label in the U.S. and internationally. This version of Coral (whose labels identified the imprint as "MCA Coral") lasted into the 1980s. Some product from MCA's former Vocalion Records budget label was manufactured with MCA Coral labels that bore Vocalion catalog numbers and was shipped in sleeves still bearing the Vocalion trademark, presumably to cut costs. ↑ Gillett, Charlie (1996). The Sound of the City: The Rise of Rock and Roll (2nd ed.). New York, N.Y.: Da Capo Press. p. 50. ISBN 978-0-306-80683-4. ↑ Watrous, Peter (1 February 1996). "Bob Thiele, 73, Record Producer for Jazz Legends". The New York Times. Retrieved 9 July 2016. ↑ Hall, Claude (10 February 1973). "MCA Drops Vocalion, Decca, Kapp and Uni". Billboard. "(They Call Her) La Bamba"